I've been looking forward to receiving the Shine anthology. 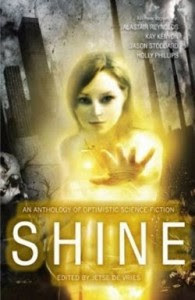 One of my stories was published on editor Jetse De Vries' Outshine twitterzine, and he sent me a most encouraging rejection for the Shine anthology itself. I was also at the launch party at Eastercon and met some of the authors.